The 2016 edition of the famous Dakar Rally has come to a close with Stéphane Peterhansel piloting his Peugeot across the finish line is first place. This is Petehansel’s sixth victory in the car class, added atop his six previous Dakar victories in the motorcycle class. With 12 wins under his belt, the man often referred to as simply Peter, has earned the unofficial title of Mr. Dakar. The long-distance endurance race spanned between Argentina and Bolivia, lasting from January 2 through January 16. This year’s event was divided into 16 separate stages, with rally points in between. All told, each of the 218 vehicles that finished the race traveled more than 5,700 miles through South America’s most unforgiving environments. Peter didn’t only clinch the final victory. He and his Peugeot team won nine of the individual stages. 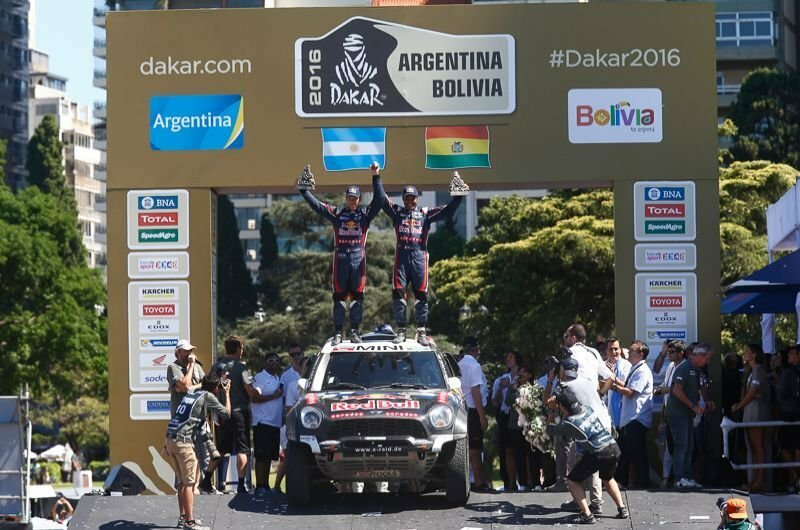 This marks the first time in 26 years that Peugeot has had a winning record at the Dakar. Though Peter and the car category took headlines, Toby Price took home the overall victory in the motorcycle category, despite this only being his second Dakar. Price is also the first Australian to win at the Dakar. Price wasn’t the only rookie to finish well in the category. Five of the final top 10 motorcycle finishers were all rookies. The quads category was also filled with drama. Marcos and Alejandro Patronelli both put in solid runs, but only thanks to mechanical failures on other top-ranked racers. In the end, it was Marcos, the younger brother, who took home the overall victory, as well as more individual stage victories. For the truck category, the long-standing reign for the Russian truck-builder Kamaz was upset when rival manufacturers Iveco and Man, despite having last year’s top three finishing drivers, Ayrat Mardeev, Eduard Nikolaev, and Andrey Karginov. While Man gave a good run, it was the Iveco brand that clenched the overall victory, with Gerard de Rooy at the wheel. This marks de Rooy’s second Dakar win – his first in 2012 – and with a sizeable margin ahead of second place and with three stage victories under his belt. Next to the Baja 1000, the Dakar Rally is one of the world’s most grueling off-road races. It pits driver, their teams, and their machines against harsh environments like deserts, rocks, and especially this year, mud. The four main winners of each category have shown they have what it takes to win. With more than 5,700 miles under their knobby tires, each driver and his respective team can rest easy – at least for a while. Next year’s Dakar is only a year away.